Also see: D major, or D-flat minor. D minor is a minor scale based on D, consisting of the pitches D, E, F, G, A, B♭, and C. In the harmonic minor, the C is raised to C♯. Its key signature has one flat (see below: Scales and keys). Its relative major is F major, and its parallel major is D major. D minor is one of the two flat-signature keys whose melodic and harmonic scale variations require the addition of a written sharp; the other is G minor. Some consider it the flattest key that is practical for a guitar to play. Of Domenico Scarlatti's 555 keyboard sonatas, which often borrow mannerisms from guitar music of the period, 151 are in minor keys, and D minor is the most often chosen minor key, with 32 sonatas. J. S. Bach's entire The Art of Fugue is in D minor and, jokingly, so is P. D. Q. Bach's Musical Sacrifice. 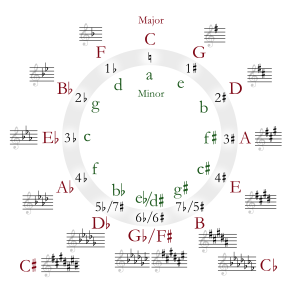 According to Alfred Einstein, the history of tuning has led D minor to be associated with counterpoint and chromaticism (for example, the chromatic fourth), and cites Mozart's chromatic Fugue in D minor. Mozart's Requiem is also written primarily in D minor. Of the two piano concertos that Mozart wrote in a minor key, one of them is in D minor, No. 20, K. 466. Sibelius's Violin Concerto is in D minor as is Schumann's, although many of the best-known violin concertos are written in D major. Michael Haydn wrote only one symphony in a minor key, in D minor, Perger 20, MH 393. Since D minor is the key of Beethoven's Symphony No. 9, Bruckner felt apprehensive about writing his own Ninth Symphony in the same key. Works in the classical music era and later beginning in minor typically end in major, or at least on a major chord (as picardy third), but there are a few notable examples of works in D minor ending in much sharper keys. Two symphonies that begin in D minor and end in E major are Havergal Brian's Gothic Symphony and Nielsen's Symphony No. 4 (The Inextinguishable). Bruckner's Ninth Symphony, which is often performed without the finale, is another example of a symphony beginning in D minor and ending in E major. Liszt's Dante Symphony opens in D minor and ends in B major. Similar to a D minor symphony ending in D major, a D major symphony can have for its allegro first movement a slow introduction in D minor. "Tonic minor Adagio introductions, especially in the key of D minor, were very popular with English composers of the year 1794," and Joseph Haydn copied this procedure for the D major symphonies he wrote in London. The first choice of clarinet for orchestral music in D minor is the clarinet in B♭, and the clarinet part is then written with an E minor key signature. This choice, however, becomes problematic for multi-movement works that begin in D minor and end in D major. The B-flat clarinet parts would be written with an E major key signature, indicating an increased reliance on side keys and thus uncomfortable fingerings. A clarinet in A playing in D major would be written with an F major key signature, but in D minor would be written in F minor. One solution is to write the first movement for clarinet in B♭ and the last movement for clarinet in A (this is, for example, what Robert Volkmann does in his Symphony No. 1 in D minor). However, this burdens the player with having to warm up the A instrument in time for the switch. Ralph Vaughan Williams in his Symphony No. 8 in D minor and Dmitri Shostakovich in his Symphony No. 12 simply keep on using clarinets in B♭ even after switching to D major (written in E major). Mily Balakirev, in his Symphony No. 2 in D minor, opts to have three clarinets, two in B♭, one in A, playing throughout the whole piece. ^ Hans-Hubert Schönzeler, Bruckner London: Calder & Boyars Ltd (1978): 106 – 107. According to Göllerich, he [Bruckner] made the remark: "It really annoys me that the theme of my new symphony is in D minor, because everybody will say now: 'Of course, Bruckner's Ninth must be in the same key as Beethoven's!'" Sherman, Charles H. Johann Michael Haydn (1737–1806), a chronological thematic catalogue of his works New York: Pendragon Press, 1993. This article is licensed under the GNU Free Documentation License. It uses material from the Wikipedia article "D minor". Allthough most Wikipedia articles provide accurate information accuracy can not be guaranteed.